With one storm behind us and more on the way, we know you have questions about how and when we treat and clear roadways. We've compiled some of our most frequently asked questions below. As always our priority is safety for our workers and the traveling public. Heavy storms will mean drivers should expect to be traveling on packed snow and ice and need to slow down and stay alert - and consider altering trips if possible. 1. How do we stay plugged in to forecasts? How do we determine when winter weather may be on the way? We monitor and prepare for conditions several ways. First, we contract for private, site-specific forecasts to understand how our roadways will be affected. Our crews can reach out for more detail from the forecasters around the clock. We also work closely with the National Weather Service both on forecasts and ways to communicate conditions to the public. 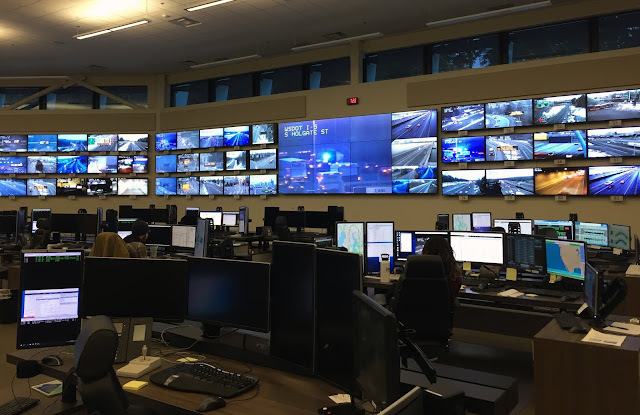 Our crews and workers in our Transportation Management Centers are also constantly monitoring conditions and sharing roadway information in case adjustments need to be made. of cameras to help crews respond and also deliver information to the public. 2. What are the steps we take when we believe a snow/ice storm will be coming? Anytime severe weather appears to be on its way we alert staff, coordinate with forecasters and check in with our maintenance crews across the state to ensure we have enough supplies and to learn of any particular concerns or challenges. Often we'll have a series of meetings or planning calls in the days leading up to a predicted storm. If needed, we can also activate our Emergency Operations Center to help respond and coordinate resources. We may speed up delivery of certain supplies such as salt to keep our sheds from running low and also have crews from other duties shift to snow and ice response. 3. What types of products does WSDOT use to treat highways, and what conditions do we use each product for? We use several products depending on conditions, generally a mix of solid salt and liquid products such as magnesium chloride, calcium chloride and sodium chloride (salt brine), all of which are salt-based products. The "chemical treatment approach" allows us to proactively treat roads to help prevent the formation of ice and compact snow on the road and help to accelerate the return to a bare and wet condition. This approach has led to a significant increase in the level of service provided to the traveling public and substantially improves mobility. While we continue to use sand in certain conditions, it is no longer the primary tool. We maintain sheds with material such as salt and sand throughout the state. Most of the time our salt is mixed with other chemicals. Pretreat roads before storms arrive (in cases of rain turning to snow this can be challenging as some pre-treat can be washed away). Liquid anti-icers are generally applied to the roadway before weather events occur, and prevent ice crystals from bonding to the pavement. The amount applied can be adjusted based on conditions. Plow snow as it arrives. Treat accumulated snow and ice on roads. Solid de-icing chemicals are used to keep accumulating snow loose and "plow-able" so it can be removed with snowplows. If snow and ice become compact and bonded to a paved surface, the solid chemical de-icers can absorb into the compact snow or ice, melt it and break it up for snowplow removal. While not used as much as in years past, sand is still put down to help improve traction in some areas and is also sometimes mixed with salt products. Sand is a more reactive than proactive treatment and tends to get blown off the road more quickly than chemical products. 4. When we say a road has been plowed, or has been treated, what does that mean? What will the roads look like? Which lanes do we clear first? Why don't we clear all the lanes? How are ramps prioritized? Our first goal in clearing roadways is ensuring the right hand lane is passable, so we'll work to get that cleared before moving on to ramps and then to the other lanes of the roadways. During large or heavy storms travelers need to be prepared that not all lanes will be cleared immediately; they could be driving on packed snow and ice. This means they'll need to adjust travel times and plans in severe weather. In some cases where snow or ice has accumulated, we'll treat with salt before clearing, which helps break the bond to the roadway. So travelers may see some roads with snow that has been treated but not yet cleared because the salt needs some time to work. We can clear roads only to see snow and ice from shoulders in some areas to melt during the day and then freeze as temperatures drop, causing roadways to ice up again. We re-treat roadways, but drivers should be prepared that any roadway could be icy during and immediately after storms and cold snaps. 5. 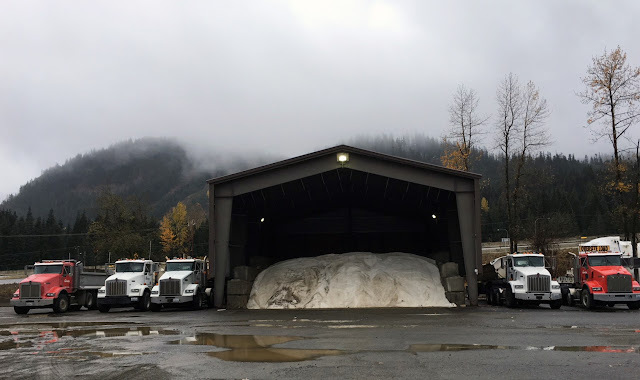 How many snow plows does WSDOT have? We have 500 snow plows statewide. Each plow covers between 50 to 75 lane miles on one run through a route. Crews will continue working routes several times a day, especially as snow keeps falling. 12-hour shifts with some overlap so that plows are always running. 6. When people say they haven't seen a snow plow at all in their drive from X to X, why would that be? Does it mean we don't have plows out? During storms our crews are out around the clock. We have a lot of miles to cover, however, and plows don't move very fast - about 25 to 30 mph - as they cover an average of about 50 miles on a run. So if a plow was 10 miles ahead of you on the roadway, you may not see it during a morning commute, but it will be out on the road again behind you after it has replenished supplies. In some areas we also need to conduct tandem plowing to completely clear several lanes - especially on passes. This means a series of plows will work one stretch to push snow off to the side. In this case, you may not see plows on your stretch of road because they're tandem plowing another section before coming to yours. 7. Why do I see trucks going by with their plows up instead of plowing? There could be a couple of reasons. They may be first treating the roadway with de-icer to break up the bond between snow and ice and roadway. In that case they would want to give the salt de-icer some time to work. It's also possible the plow is on its way to an assigned area a bit farther out and another plow will soon be clearing the area you're at. Because plows run slowly when the plow is down, it's more efficient to send some to further out areas before they start clearing than to have them try to plow the entire way there. We have assigned routes for drivers to clear as much area as possible on each shift. Also, a plow could be heading back to a supply area to refill with de-icing material and thus wouldn't have the plow down to slow that return trip. 8. 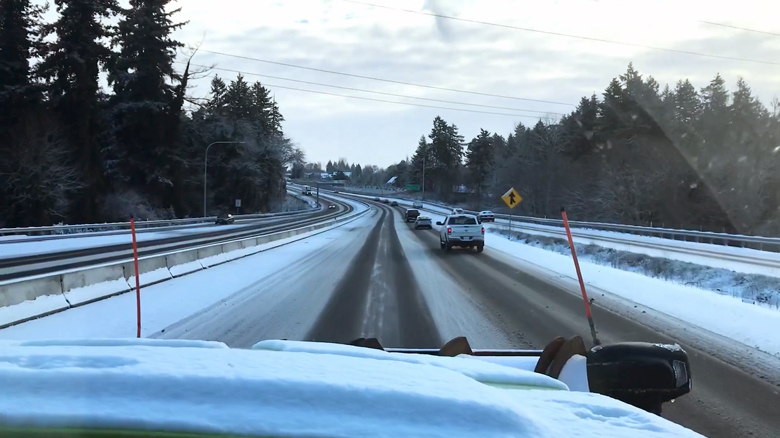 How does WSDOT prioritize which routes are plowed and treated? At what point will WSDOT move trucks from a top priority route to a lesser-priority route? Generally, our priority routes are determined by the volume of traffic on each roadway. Routes with the heaviest traffic are addressed first and less used routes have lower priorities. More information about this is available online. Sometimes this means number of trucks versus location - we don't send all plows on the west side to I-5 first, for example. But areas with a major interstate would have more plows regularly stationed in their area. 9. What are the challenges plow operators face during snow/ice operations? How can drivers help them? Plow drivers are concentrating on the roadway, ensuring they're plowing or treating efficiently and avoiding any hazards. Please give them space and be patient. Your best bet is to wait until a snowplow operator pulls over and lets you pass when it is safe. Plows can throw snow to either side of the vehicle and some equipment extends from the plow and may not be easy to see in heavy snow or at night. Visibility is difficult for the plow operator too, so please allow space and only pass if it's safe to do so. 10. What's the typical shift look like for a plow operator during these events? When do they start and how long do they work? How do they prepare the vehicle? A normal shift is 10 hours but it is extended to 12 hours during storm prep and response. 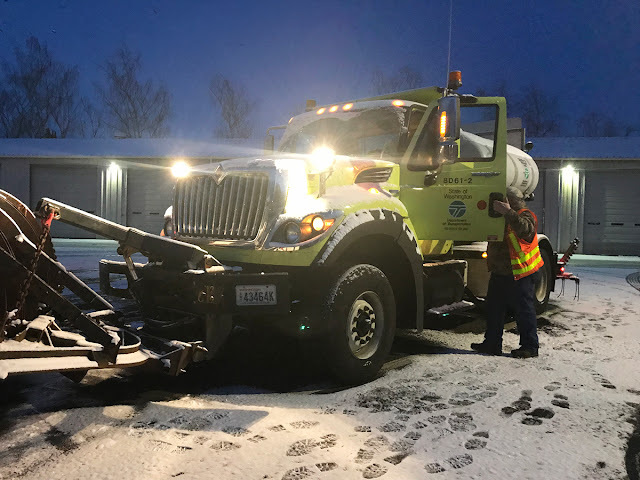 Crews will come in and talk with the person who just finished on their route and then ensure their vehicle is stocked with products such as salt, mixes and sand, and then head out on their route. Plows may be diverted if a trouble spot develops but generally run a planned route for most efficient coverage of large areas. 11. Why doesn't WSDOT have more snow plows? We have a lot of snowplows - 500 statewide. But we also must balance resources against needs just as families do in their household budget. In our case, that includes a number of other maintenance costs and duties throughout the year in addition to snow and ice equipment. In areas that rarely see snow, it's not cost effective to have large numbers of plows that may not be needed most years. Our maintenance crew shifts also are extended from 10 hours to 12 hours when storms are approaching and we can call in workers from other areas to help cover routes. Shifts also have a built in overlap so that roads are covered while other workers go on or off shift. 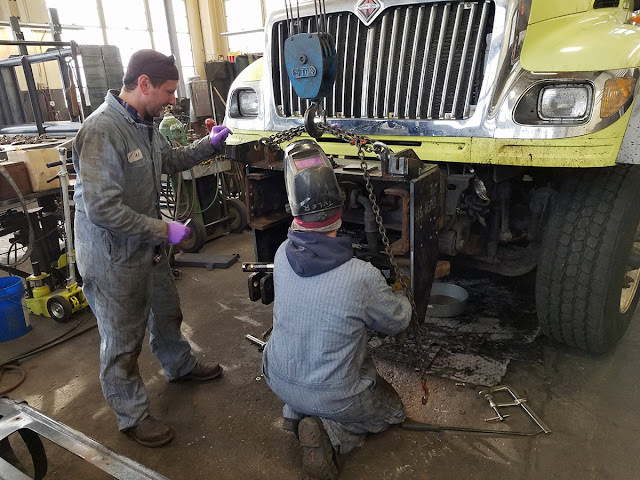 Our mechanics work to keep our fleet of 500 snow plows in good shape. 12. How do we coordinate with cities and counties? Some state routes aren't our jurisdiction. How do we make sure everything is accounted for? Coverage and plowing responsibility is determined well before storms approach. We also hold annual snow and ice prep meetings across the state to ensure everyone knows our plans and how to contact us. We work closely with our partners in cities and counties to ensure everyone is covering the roads under their jurisdiction. We also sell salt and other products to smaller jurisdictions, which is easier than them trucking in their own supplies. 13. How fast does a snowplow move? Plows generally move between 25 - 30 mph while applying product or clearing snow and ice. They need to move slower so that they can focus on their task and ensure they're working efficiently. Also, they are larger vehicles and have some limited sight lines. If plows are running at higher speed they throw snow off the sides too fast and too hard, which isn't safe. give them plenty of room as they work to keep our highways safe. 14. Can we shift resources from one area to another if the storm path changes? Yes, we can and we do. This can be staff, equipment or supplies and is balanced on where the need is the greatest. In some statewide events - like this coming weekend - there may be fewer unaffected areas to pull from, but managers still discuss and prioritize based on needs and conditions. 15. I know you have a lot of roads that are considered priorities. When deciding which of those roads to treat and deal with first, are you drawing from on-the-ground reports/data, camera information, historical trouble with the road, or just a mix depending on conditions? All these types of information go into treatment plans as well as any changes that might be made as conditions change or we observe new issues. This can be a quick discussion between plow drivers as they hand over trucks - like a particular area along a route could use some extra work - or more formal as we decide to re-deploy trucks to another area. Excellent information, thanks for posting! Great!!!!! WISH PEOPLE WOULD SLOW DOWM? Posted on your Facebook. You guys try to keep it clear, and good job. In regards to the Hwy 526 W. Mulketeo/Whidby Island ramp off I-5 if your going to Everrgreen Way in Everett, if there is Black ice on the ramp at the top, you can't see it. There are no signs about icy conditions or a picture of a car skidding with a thermometer next to it. You guys need to close that ramp during icy conditions or when we have this type of weather currently. I almost lost my life up there as I hit black ice and crashed into the median on New Years 2017 around 2am heading home coming from church in Seattle. 3 others hit that ice and crashed into me. If it wasn't for a off duty Seattle policeman who just happened to go that way calling someone to block that ramp as folks were going too fast getting off that exit. Most don't do the speed limit getting off. Just a suggestion for ramps that are similar to that one. I almost lost my life on there. Being up that high was scary. Thankful to the Everett Fire Department for blocking that ramp. When Bob Tailing with a Class 8 Motor Vehicle are Tire Socks allowed on Super Single Tires? Can we please get Kenwood dr in Everett plowed one time so that we can get out of driveways today? Can we use snow chains on local roads ? for a grocery trip etc.. In regards to the question about tire socks on "super single tires": For such as specific question I suggest you check in with our partners at the Washington State Patrol – they're the agency that approves certain types of tire socks for use by type of vehicle. You can call the Washington State Patrol Equipment and Standards Section in Olympia at (360) 596-4017 or send your inquiries via e-mail to equipment@wsp.wa.gov. Thanks for checking before heading out! WSDOT treats and clears state roadways, such as state routes and interstates. Community roads are cleared by either city or county public works departments, so you'll want to reach out to them to see about their plowing schedules. Sreenivas N, there is no restriction to using chains on roadways if you feel conditions call for them. However, you’ll want to be sure they're properly installed and that you need to drive very slowly with chains – both on snow and pavement. What constitutes and "oversized vehicle " such as what is prohibited tonight , tuesday 2/19? For traction restrictions on passes, an oversized vehicle is one that exceeds 8' 6" in width, 14' in height and/or exceeding 40' in length for a single vehicle. Semi trailers in excess of 53 ft. and double trailers in excess of 61 ft. are also considered oversize. These vehicles also require permits to travel within the state. So a regular sized semi-truck is still allowed to cross the pass when oversized vehicles are prohibited, but some larger ones are not.